Hello crafty friends and Happy Valentine's Day! 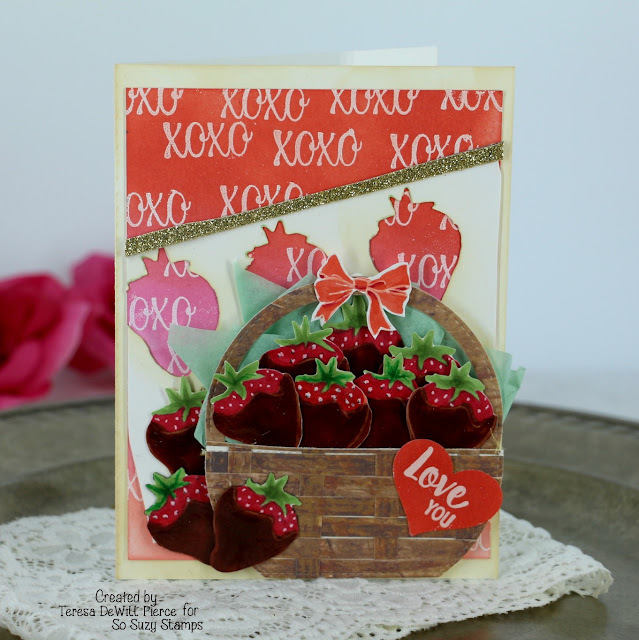 I have a really sweet card with this sweet basket of strawberries utilizing 4 small stamps from So Suzy Stamps - a strawberry, XOXO and the Love You sentiment. I used a multiple stamping technique to add big impact. I made the basket from strips of paper - yay for creating your own embellishments! 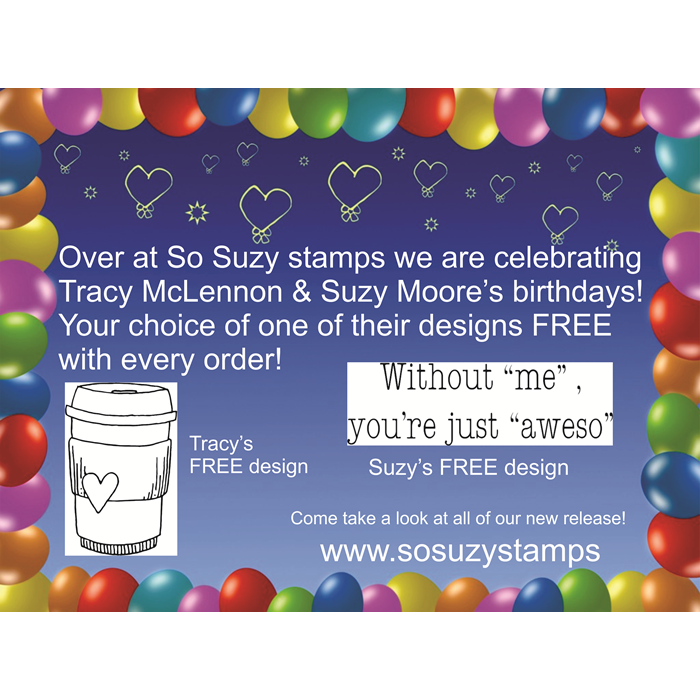 start with 4" x 5.25" piece of white cardstock - stamped the XOXO stamp multiple times over background in Versamark. - stamped multiple times onto Neenah white cardstock in Antique linen distress ink to do no line coloring. Used copies in red and brown to color the strawberry, then 3 shades of green to color the leaves. Used white gel pen to add detail to the strawberries. 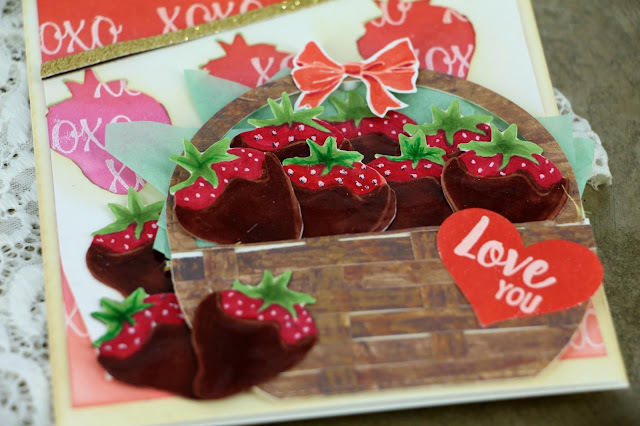 Die cut out the strawberries with Brother Scan N Cut (but can be fussy cut instead). I stamped in lines so that I could use the negative space as a panel. Added this glossy medium (glossy accents could also be used) to create the "chocolate" part. You want it to be slightly thick so it looks more dimensional. It's much easier to manage by putting temporary adhesive on the back of each strawberry and putting them on something that is non- stick, such as leftover release paper - I happen to use leftover paper from my Xyron sticker maker for this type of thing all the time. That way any drips won't keep you from removing the die cut after dried. 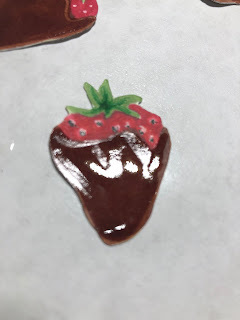 Close up of one of the strawberries with the glossy finish - isn't it pretty! I wish I could have gotten the right angle in my photographs above - at least you can get an idea of what it looks like in real life. Starting with wood patterned paper I cut into 1/4" strips. I arranged into a basketweave pattern (see photo below) in a rectangle shape. 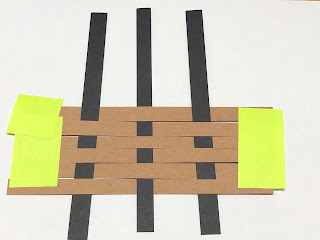 To keep the process easier, lay down the horizontal strips first and tape at both ends (which will get cut off later). Weave in the vertical strips - think of it as going in between cones in a zigzag fashion. Since I wanted a more loose weave I chose to leave space in between the vertical strips - about 1/2" or so. Once you have the placement right - put a piece of a removable tape such as a post it tape or a post it note over the top of the entire "panel". This is to temporarily hold all the strips in place. Post it tape is to me kind of like Frank's Red Hot Sauce in that hilarious commercial - "I put that (bleep) on everything". The black strips in photo below represent the vertical strips - thought this would be the easiest way to illustrate without a video. I am thinking a video would have been easier (maybe that will come next week). So if you don't have patterned paper, kraft would certainly work in it's place. Flip over the piece then glue a solid piece of cardstock over the back side of the now weaved strips. You don't want to skip this step as it adds stability to the base and it will hold together when you die cut it. Used circle die to cut out bottom of basket shape. Cut a flat bottom across the smaller end. I used a stitched die so that I would have neat edges and the stitches work well to hold it together too. Used two circle dies to create the basket handle. Nest the smaller one inside the larger one on the paper in order to get the perfectly sized handle - I used the same nesting circle die set throughout the die cutting process. The largest size circle was used for both the bottom of the basket as well as the handle. Stamped bow in Versamark - added white embossing powder and heat set. Used an ink blending tool to color over top with Distress Oxide ink to match the background colors. I reused something that would normally get tossed. It wasn't part of my original plan, but when I looked at the negative space left I realized that since I had (unintentionally) stamped the strawberries in neat little rows, and that the leftover looks a lot like a stencil. I angled it rather than putting in a straight horizontal line to make it more interesting and show the background through the spaces left where I had cut out the strawberries with my electronic die cutting machine. You could totally leave this out, stamp the strawberries but not color in - the idea is that you can sometimes put what you'd normally call scraps to good use. I sponged on some antique linen ink around the edges where the die cuts were. Put basket base face down - glue down the ends of the handle on the back side. Arranged the strawberries behind the basket which is a bit challenging working from the back side - I used post it tape to keep them in the general spot. I then turned the whole thing over to make sure that the strawberries were arranged like I wanted. I carefully turned the whole thing back over and applied glue to the back of the basket and pressed the strawberries in place. since the tissue paper is behind the strawberries, I then added some mint paper on top. when it's flipped back over then you have the basket in front, strawberries in the middle and tissue paper in the back - like a little sandwich! The "love you" sentiment was stamped in Versamark onto white cardstock, then I added white embossing powder and heat set it. I sponged over it with Candied Apple Distress Ink to make it match the rest of the color scheme. Used a heart punch to cut it out. The bow was also stamped in the same fashion as the sentiment and used Copics to color it in before fussy cutting it to glue to the top of the basket handle. Hope you liked my tutorial! Please check out the following deals that you still have some time to take advantage of. Special deal during February 2018 only at So Suzy Stamps 15% off all masculine, transportation and western stamps With ALL ORDERS, your choice between the coffee cup stamp or the sentiment with every order in February 2018 for FREE. Such a COOL card! I LOVE it!